Stroll your supermarket’s aisles and you’ll surely notice the onslaught of locally sourced, small-batch, artisanal goods. The packaging of those products is seeing its own old-time resurgence, with carefully-considered branding that includes a revival of hand-lettered graphics. Outside the Box: Hand-Drawn Packaging from Around the World, a new book by graphic designer Gail Anderson, shows how a twist of a talented wrist helps basic packaging transform into alluring, intriguing design specimens. Not only do these types of graphics communicate value—your eye can immediately register the evidence of a human’s touch in that hand-scrawled type, for example—but they also set aside these products from the other purely computer-generated boxes on the shelf. Of course, it’s not just those folksy purveyors who rely on craft lettering. Big companies have gotten in on the act as well, employing hand-drawn elements to help consumers forget for a moment that they’re purchasing something mass-produced. 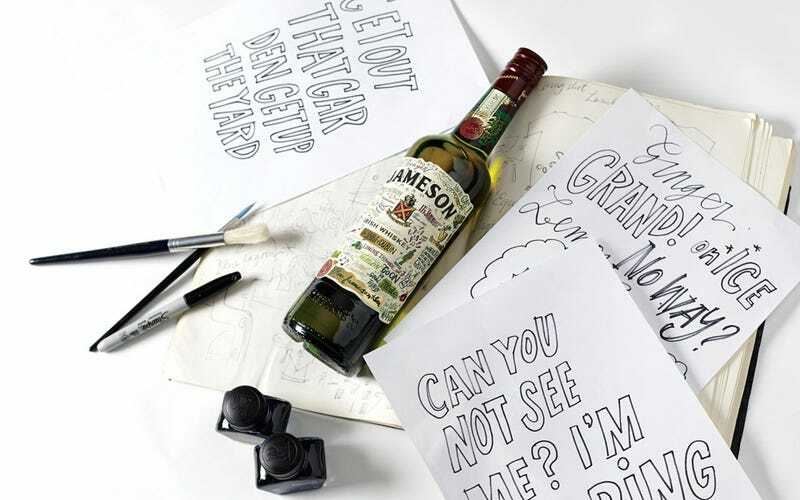 Here’s how nine brands are taking advantage of the hand-drawn trend to make their products stand out, with some behind-the-scenes sketches that show the work that goes into every last letter. Hand letterer Anna Tou’s work can be seen across the entire Chipotle branding system, on everything from cups to walls. Inspiration for Evil Spirits vodka comes from Ouija boards, and was born from the idea that alcohol was considered evil in the Prohibition era. G’NOSH typography is hand painted onto black cards before being scanned and isolated in Adobe Photoshop, where the final brand environment is composed. Martin Schmetzer’s precision shines on a project that turned out to be a labor of love. For this project, he drew his rough sketches slightly more tightly than he usually would to “do my vision and concept more justice,” he says. The original Nuts.com packaging is paired with its updated counterpart by illustrator Christoph Niemann. The difference is striking. The Nagging Doubt wine labels were created by letterer Dana Tanamachi-Williams on a 4’ x 7’ chalkboard, then photographed and reduced to size. The QR code in the corner of the label links to a time-lapse video of the work being created. Alec Doherty has illustrated more than 150 labels for London’s Partizan Brewing. Futura’s clear, geometric shapes often provide the underlying framework for Doherty’s human forms.